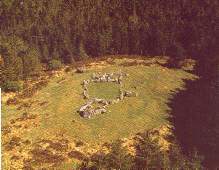 Magheraghanrush (Deerpark) (Court Tomb) on The Modern Antiquarian, the UK & Ireland's most popular megalithic community website. 20 images, 1 piece of folklore, 1 weblink, plus information on many more ancient sites nearby and across the UK & Ireland. The Giants Grave is situated in the Deerpark. There are three departments in it. Some say that Giants were buried there and that it got its name from them. Others say that Owen Bell was buried there and others say it was a Druid's Altar. There are a number of big stones there and there is a lovely view from it. It was more like a big grave in olden time than it is at present. There is an old story told of the grave by an old man who lived in Chapel Town near Cnoc Mór, a hill near Colga lake. He told that the giant stood on the middle of this hill to consider where he should have his grave. He looked towards the sunrise and said he would have it in that direction. He walked to the Deerpark and dug his grave there. He found his health failing. He remained in the Deerpark and lay in his grave every night. One night he died in it. It is not known how he was covered but it was well done. From the Schools Collection of the 1930s, currently being digitised at duchas.ie. I like that other features of the landscape and the direction of the sunrise should be part of the story. Was Owen Bell one of the kings of Connacht? Mere googling is not telling me much. A small aerial photo of the tomb. A ruined wedge tomb, but a classic of its type. These squat tombs always remind me of some futuristic tank crawling across the landscape. I'd been up at the court tomb and the cashel and felt up for a further little trek down to what's call a 'giant's grave' on the old OS maps at archaeology.ie. Approaching the tomb from above it's hard not to be disappointed as it's a tangled mess of brambles and briers that you see at first. However, there's quite a bit of the structure left. The two 'portal' stones are massive and there's some evidence of the double kerbing at the back of the tomb. Standing a little to the north-west of the tomb you get a really good idea of where they came up with the name for this classification of Irish tomb, its wedge shape revealed as the tomb gradually tapers back towards the chamber. The surrounding terrain in these fields west of Magheraghanrush Deerpark show plenty of signs of earth working and quarrying that seem to have been undertaken by the people who first constructed the court tomb, then the wedge tomb and the cashel. South-east of the court tomb and north-west of the wedge tomb, about equidistant from both, this site is on private land. There's a style in the wall that leads down to it. It's quite a wonderful place, perched above Colgagh Lough and with views west across to Knocknarea. I could imagine this site as a prized and well defended homestead. The souterrain has been uncovered and it's wonderful to see the passage snake down into a corballed chamber. The cashel is very ruinous but is one of those places that tugs at your heart, steeped as it is in the mysteries of pre-history.